From its perch on a hilltop facing the city of Gangtok, the capital of Sikkim, the monastery complex at Rumtek Dharma Chakra Centre embodies the vision and aspiration of the Sixteenth Karmapa, Rangjung Rigpe Dorje, to establish his seat-in-exile to help spread the teachings of the Buddha throughout the world. 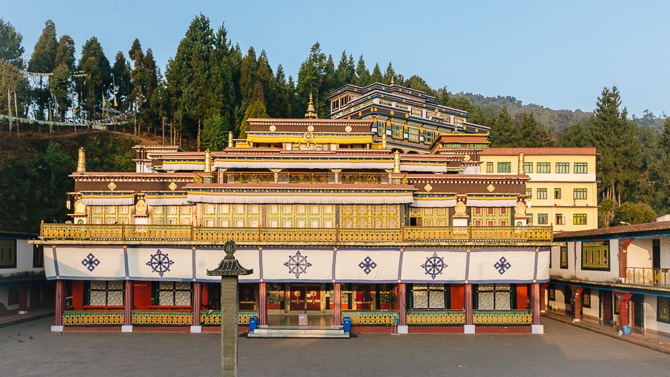 The monastery, the largest in Sikkim, is home to the monks community, the place where they perform the sacred rituals and practices of the Karma Kagyu lineage. Many sacred objects are housed within the complex, and one of the most magnificent is the Golden Stupa, which contains the precious relics of His Holiness the Sixteenth Karmapa. Opposite that building is the shedra, or college, Karma Shri Nalanda Institute for Higher Buddhist Studies. Members of the lay sangha practice in the community lhakhang just outside the walls of the monastery complex. Surrounding Rumtek Dharma Chakra Centre is the stupa walkway, where monks, pilgrims, and visitors alike perform kora.